The battle was on in San Francisco's Dolores Park this weekend. Oh, sure, you could recycle your cardboard boxes. But wouldn't you rather take them into battle? This weekend saw the return of "Boxwars," an event in which creative young people cover themselves in cardboard and thrash around at each other with tubes. Held in Dolores Park, participants fashioned costumes resembling robots, a giraffe and a samurai. One person had a mace can made of duct tape. Another had a post-consumer battle axe. 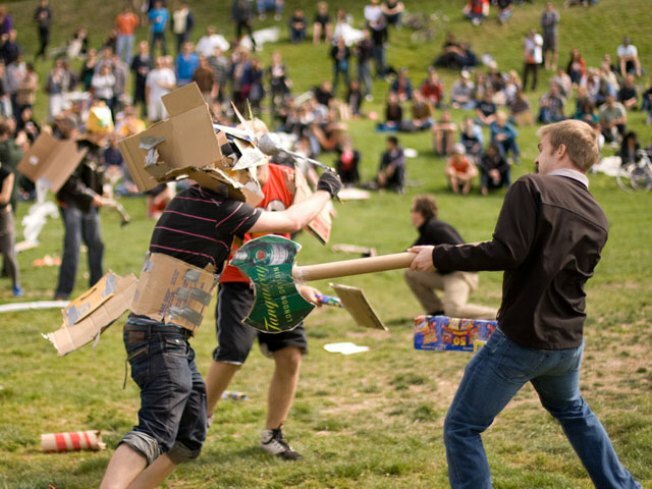 The event was coordinated through Boxwars.net, which describes itself as a "network of cardboard warriors who are engaged in an epic struggle for the liberty of corrugated creativity .... or it may not have a point at all." It traces its formal history to Melbourne in 2002, and has since been exported to Canada and the UK. But don't confuse it with the Cardboard Tube Fighting League. Though their membership may overlap, the CTFL is a separate entity, hosting tube-fighting contests in and around the City. "The CTFL was created out of a desperate need to better train and arm citizens with cardboard tubes," says the CTFL's manifesto. Poor Dolores Park has had a tough time of it lately. A man was recently stabbed while walking through the park alone at 1:30 a.m. And this weekend, a dirtbike gang drove though, harassing peaceful park-goers and closing down neighborhood merchants. When the fun was done, participants did their best to clean up their cardboard waste. A few folks repurposed the cardboard one last time, using it to slide down a nearby hillside. So, basically, the city should probably just give up on ever getting grass to grow there.